Federal law requires that most bridges in the United States be regularly inspected by the state departments of transportation for functionality and structural condition. The states report this information—and much more—on each bridge under their jurisdiction to the U.S. Department of Transportation (U.S. DOT) for inclusion in the National Bridge Inventory (NBI). Unless indicated otherwise, all of the information available in ARTBA’s Bridge Report comes from the 2018 NBI and is collected and managed by the U.S. DOT’s Federal Highway Administration (FHWA). The information is updated at least once a year. As such, it is possible the status and condition on a particular bridge may have changed since the data were collected. For absolute surety on the current status and condition of a specific bridge, please contact the relevant state and/or local transportation department. The current NBI data was updated on March 14, 2019. The FHWA uses four factors in determining the “sufficiency rating” of a bridge, which is its sufficiency to remain in service. Each bridge is assigned a numerical percentage rating between zero and 100, with 100 being the ideal. Effective Jan. 1, 2018, FHWA changed the definition of structurally deficient as part of the final rule on highway and bridge performance measures, published May 20, 2017, pursuant to the 2012 federal aid highway bill Moving Ahead for Progress in the 21st Century Act (MAP-21). Two measures that were previously used to classify bridges as structurally deficient are no longer used. This includes bridges where the overall structural evaluation was rated in poor or worse condition, or with insufficient waterway openings. The new definition limits the classification to bridges where one of the key structural elements—the deck, superstructure, substructure or culverts—are rated in poor or worse condition. Based on the new definition of structurally deficient, there are 6,533 bridges that would have been classified as structurally deficient in 2017, but did not meet the new criteria in 2018. Bridge ratings are updated as inspections are completed—each year some bridges are classified as structurally deficient and others are removed from that category as they undergo repair, rehabilitation or replacement. Nearly 88 percent of the bridges classified as structurally deficient in 2018 had the same rating in 2017. There were 5,660 bridges newly classified as structurally deficient in 2018. Another 6,229 bridges that were structurally deficient in 2017 were removed from that category in 2018, for an overall net decline of 567 bridges. 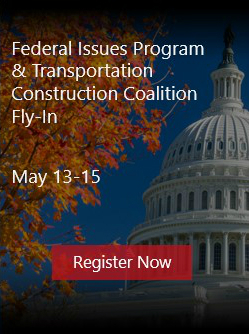 The Washington, D.C.-based American Road & Transportation Builders Association (ARTBA) is a non-partisan federation whose primary goal is to aggressively grow and protect transportation infrastructure investment to meet the public and business demand for safe and efficient travel. ARTBA was established in 1902 by Michigan public official Horatio Earle with this express purpose: to advocate for construction of a federally-led “Capital Connecting Government Highway” that he said would connect “every state capital with every other state capital, and every capital with the United States Capital-Washington.” Mission accomplished in 1956.